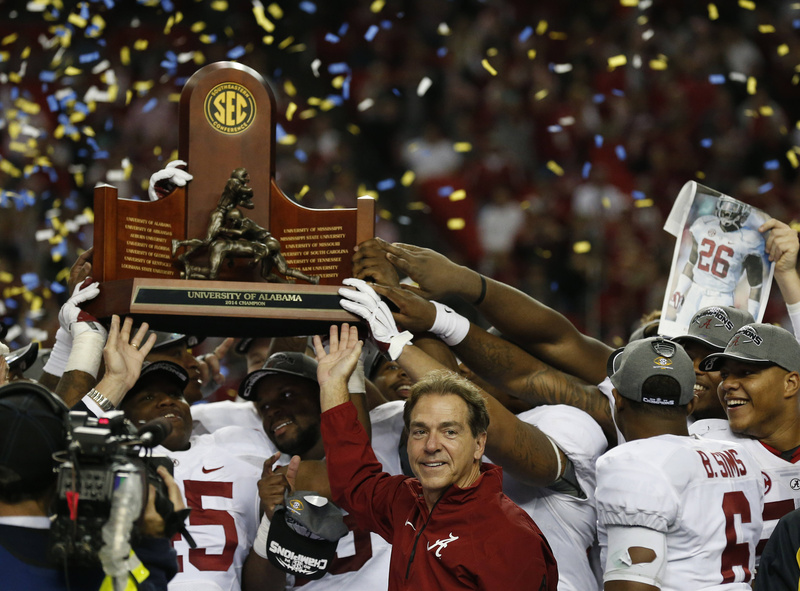 Blake Sims threw a pair of touchdown passes, T.J. Yeldon and Derrick Henry each had a couple of touchdown runs, and top-ranked Alabama pulled away in the fourth quarter to win its 24th Southeastern Conference championship with a 42-13 victory over No. 14 Missouri on Saturday in Atlanta. Missouri made it a one-score game in the third quarter, but Alabama (12-1) scored three touchdowns in the fourth to lock up its spot in college football’s first playoff. And if the committee was impressed by second-ranked Oregon’s 51-13 rout of Arizona in the Pac-12 title game, they got another equally dominating performance from their top-ranked team. A year ago, Alabama was poised to make a run at its third straight national title when Auburn won the Iron Bowl on the final play – a 109-yard return of a missed field goal. ACC: (2) Florida State 37, (12) Georgia Tech 35: Jameis Winston threw for 309 yards and three touchdowns, and the Seminoles held off the Yellow Jackets in Charlotte, North Carolina, to win their third consecutive Atlantic Coast Conference championship. The Seminoles (13-0, 9-0 ACC) will find out today if it’s enough to earn them a berth in the first College Football Playoff. Rashad Greene had seven catches for 123 yards and two scores and freshman Dalvin Cook had 220 yards from scrimmage and a touchdown in his first college start as the defending national champions stretched their winning streak to 29 games. Big Ten: (6) Ohio State 59, (13) Wisconsin 0: Cardale Jones threw for 257 yards and three touchdowns, Ezekiel Elliott ran for a career-high 220 yards and two scores and the Buckeyes (12-1, 8-0 Big Ten) made an emphatic statement with a rout over the Badgers (10-3, 7-1) in the Big Ten championship game in Indianapolis. Ohio State must wait to see if they’ve done enough to earn one of the four spots in this year’s inaugural playoff. Ohio State has won 11 straight, this time with Jones, who started the season No. 3 on the quarterback depth chart. Melvin Gordon ran for 76 yards as the Badgers had a seven-game win streak snapped. It was Wisconsin’s worst loss since 1979 and its first shutout since 1997. Mountain West: (22) Boise State 28, Fresno State 14: Grant Hedrick ran for two touchdowns to lead the Broncos (11-2, 7-1) to a victory over the Bulldogs (6-7, 5-3) to win the Mountain West Conference championship in Boise, Idaho. Boise State, which claimed a share of the conference title in 2012, won its first outright league championship since joining the Mountain West four years ago. The Broncos preserved their chance to get the lone slot for a team outside the power five conferences in a major New Year’s Day bowl game. Hedrick was 9-of-16 passing for 155 yards, and had 81 yards rushing with the two scores to earn the game’s offensive MVP honors. Conference USA: Marshall 26, Louisiana Tech 23: Rakeem Cato passed 5 yards to Deon-Tay McManus with 1:50 remaining to lift the Thundering Herd (12-1, 7-1) over the Bulldogs (8-5, 7-1) in Huntington, West Virginia, for their first Conference-USA championship.